A growing number of iPhone 6 owners are complaining that their recently-purchased handsets are exhibiting slight surface scratching not seen with previous models, with some alleging flaws in material and design. 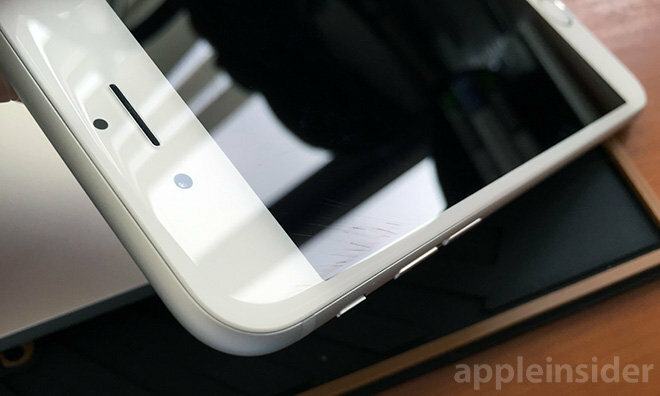 Surface scratches seen on iPhone 6. Multiple iPhone 6 and iPhone 6 Plus users have taken to Apple's Support Communities forum to report issues with the handset's display cover glass, which they claim is more prone to scratching than previous iPhone models. The thread, now at over 103,000 views and 626 replies, started on Sep. 23 with user jake.underwood26 saying his iPhone 6 Plus exhibited visible scratching near the display's corners after "extremely" good care. Apple's latest iPhone generation went on sale four days earlier on Sep. 19. Many other forum posters followed with similar responses, saying they too found scratches after less than one week of normal use. Some compared the iPhone 6 to past iPhone models, noting previous generations were not as prone to surface scratches even after years of use. The exact material used to shield the iPhone 6 display has not been officially revealed, though some believe it to be Corning's Gorilla Glass 3 branded alkali-aluminosilicate glass. Instead, Apple touts the use of "strengthened Ion-X" glass, an ion-impregnated material purportedly harder than normal covers. AppleInsider has seen the issue first hand from a user who carries their phone in a microfiber satchel. In this case, as seen in the photo above, it appears as though the glass was perhaps raked against a hard, flat surface or etched with small debris, perhaps during polishing. The miniature trenches are deep enough to be felt with a thumbnail and can be seen when the display is turned off. There are any number of reasons as to why Apple's iPhone 6 is seemingly more prone to screen scratches. For one, the latest generation iPhone is the first to use a curved display glass with no bezel "lip" to protect against scrapes. Previous iPhones like the most recent iPhone 5s used flat pieces of glass surrounded by a thermoplastic peripheral material housed in a harder polymer wrap. This structure helped for shock protection, deflecting encounters with foreign objects and would keep the screen protected if laid down on its face. For the iPhone 6, Apple carried over the shock resistant thermoplastic material, but now has it sandwiched between the display assembly and phone body. The hard plastic side wall was also deleted in favor of a cover that curves toward the rounded aluminum chassis. While great for finger feel and gesture control, a curved edge design necessarily leaves the cover glass exposed to contact with hard surfaces. Apple has not officially responded to user reports, though some owners have found success in taking their scratched iPhone in to an Apple Store for replacement. There is apparently no repair protocol entered into Apple's system, however, as other forum members did not receive the same service. AppleInsider has reached out to Apple regarding the issue and will update this story when a reply is received.